I’m writing a first draft right now. I’m excited about the story. I know the main characters, know the main plot points. Usually, I can estimate a word count goal for the day (depending on what I have going on) and meet it in a set amount of time. Not this time, my friends. I’m writing slow. I’m talking S-L-O-W. Yesterday, I didn’t even hit my word count goal, and I worked past six pm. Today, I did hit my word count goal, but it took seven hours to do it. I want to write faster! What’s going on? It’s January. I live in northern Ohio, and we had a severe winter storm this weekend. Yesterday it was below zero. Today wasn’t much better. I can’t blame everything on the weather, but being cooped up inside with gray skies does affect me. This is the first book in a new series. I’m still getting to know the secondary characters. I’m creating the town and the feel of the community. Plus, there’s a lot of plot to pack into this story. I’m in the middle scenes. My mind can’t always keep track of the various plot threads in this phase. I drop things–the faith thread, the romantic tension, the conflicts and goals. And it slows me down because I know I’m not getting it all but I don’t know what I’m dropping. At night, I usually get lightbulb moments–hmm…I forgot to address the emotional fallout from the previous scene. Or this IS a romance, right? Shouldn’t the MCs be getting butterflies? That’s all I’ve got. Tomorrow I’ll force myself to sit in my office and tap out words until another scene takes shape. Then another. And at some point I will walk away from my laptop–with or without having met my word goal for the day. And I’ll repeat this until the book is finished. Then I’ll find all the threads I dropped and all the areas I know are flat, and I’ll revise the book to make it shine. In the meantime, I’ll have another caramel and try not to overthink it. 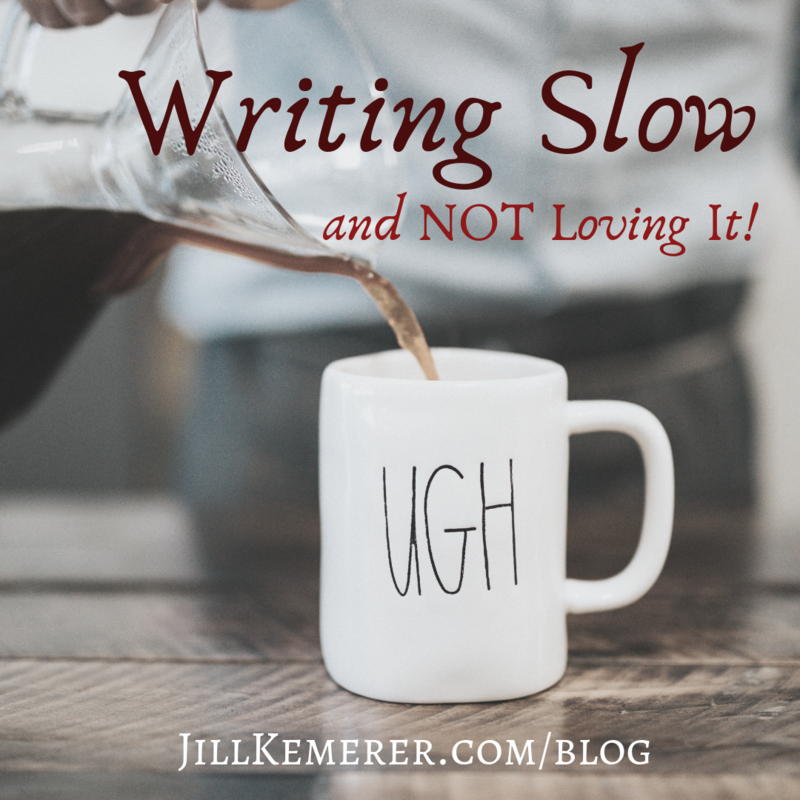 Writers, what slows your writing down? How do you get through it? Thank you to everyone who entered The Rancher’s Unexpected Baby (by Jill Lynn) giveaway! The winner is Lori R.! Congratulations, Lori, check your email for further instructions! Weather. The dreaded middle. Something wrong in a previous scene/chapter. Not wanting to reach the end because I love the characters so much. Not wanting to reach the end because the book scares me (what if my editor doesn’t like it???). Sometimes, I just have to sit in the chair and tap out the words. Slowly. Hang in there, Jill! Kristina, yes, not wanting to reach the end because I love my characters so much. Can relate. Yes to all of the above!! I’m so glad it’s not only me! Jill, we have the same weather here. It has been a nightmare. I did not leave my house from 2 p.m. Saturday afternoon to Tuesday evening. Your reasons for writing slowly make sense. I’ve got another one: the more we advance into this writing life, the more we realize what a story could be and where we could take it. So we’re more careful, even in a draft. We know what good writing is and we tend to self-edit more, even when we’re supposed to be writing a draft, getting it all down on paper, etc. Our longing to be good, better, best–our personal best, not comparing ourselves to other people–automatically slows us down. Or it could be the weather, on which I am blaming pretty much everything these days. That’s a very good point, Kathy. I do try to up my game with each book. I don’t always succeed, but rushing through a draft doesn’t always give me the space I need to figure out what’s missing. On a side note, winter will end at some point, right?? Right? Haha!! Hang in there, and I’ll try to do the same! One thing that slowed down my writing recently was sharing a wonderful time with family. Our family from VA came to visit and I didn’t write while they were here. Family is most important and we celebrated a late Christmas. They have returned to VA now and I can focus on writing. I am thankful for the precious, blessed memories created with family and look forward to seeing them again soon. A good thing is how we laughed so much and story ideas kept popping into my head. haha! Family is so important! I’m glad you made time for them. And you’re right–story ideas keep popping up when we’re having fun! I have a full-time job, yet started writing the book that has been on my heart for 20 years 2 summers ago. With a “complicated” family life, too, I’m busy a LOT. But I need this story OUT OF MY HEAD so I’m praying for time to get it done this year. Talk about S-L-O-W! Vickie, it’s hard staying motivated when you have to fit writing in around other major commitments. Good for you! I’m glad you’re getting the story of your heart out there! Even on the slow days, I remind myself I’m making progress. Anywho….I typed this out as much for me as to reply to your post. Hope it helps. I’m not on deadline now, so the effort to do nothing is strong. I even turned down a Harlequin contract in the middle of all the craziness going on here. But now that things have settled, I’m trying to focus. On the here and now. Hope the words come today. I’m sorry about your mom–but glad she’s doing better. Last summer I shifted my attitude and thinking to “the process” like you mentioned, and I enjoyed my days so much more! I think I’m so goal-oriented it’s hard for me to keep the right mindset. For me, sitting down and doing what I intend–sticking with my schedule–is what I find rewarding. The actual word count puts pressure on me that I might not need. Maybe I should go back to writing for set amounts of time instead of focusing solely on word counts. Jill, I feel your pain! I’ve been trying to wrap up a first draft since November, and life and editing jobs keep jumping in the way. I’m trying to get back to it this weekend. As for feeling stuck or sluggish while writing, I like to reread the previous chapter or two when I’m stuck. Sometimes more. I review my notes, since I jot down important things I *must* remember (because one story found me forgetting the lead’s bodyguards — oops! — still need to go back and add them into the middle of the story). Usually, rereading the scene before where I need to write will get me going. If I feel like I don’t know the secondary characters well enough, I’ll take a day or two to sketch them out a bit. How would they handle situations that are embarrassing, infuriating, or awkward? Playing around with those types of scenes (which may never make it into the story) helps me to figure out the heart inside these secondary characters, which makes my writing stronger. Happy writing, Jill. I know you can do this! Good points! Reviewing the previous scenes does jumpstart ideas! And I like the idea of spending time just on the secondary characters. They usually show up in future books, so I need to get them right! previous post: What are Your January 2019 Goals?